Are the Fats in Pistachio Nuts Bad for You? If you've stopped eating nuts because they're too high in fat and calories, you may need to reconsider. Sure, the fat in nuts like pistachios makes up most of the calories, but the fat in pistachios isn't bad for you. In fact, the types of fats in pistachios may lower your risk of heart disease — the leading cause of death in men and women in the United States — and help you manage your weight. Yes, pistachios are good for you despite getting 75 percent of their calories from fat. These sweet nuts are rich in heart-healthy fats, fiber, vitamins, minerals, and phytonutrients. Pistachios are one of the best sources of vitamin B6, which is an essential nutrient that plays an important role in over 100 enzymatic reactions in your body, as well as the metabolism of protein, fat and carbohydrates. Vitamin B6 also helps maintain blood sugar levels and supports immune function. Although not a significant source, pistachio nuts can also help you meet your daily needs for iron, potassium, folate and vitamins A and E.
Are you a little curious about why pistachios are green? It's the lutein content. This pigment is best known for its role in eye health, but it may also enhance your memory and learning power. Nearly 75 percent of the calories in a serving of pistachio nuts comes from its fat content. But before you put your bag of pistachios back into the cabinet, you need to know more about the types of fats found in these super-healthy nuts. Although 1 ounce of pistachios has 13 grams of total fat, most of that comes from heart-healthy monounsaturated and polyunsaturated fats. According to the American Heart Association, most of the fats in your diet should come from monounsaturated and polyunsaturated fats. The monounsaturated fats in the pistachio nut help keep your cholesterol levels low and support the health and development of the cells in your body. While most of the fat in pistachios is monounsaturated, the nuts are also a source of polyunsaturated fats, including the essential omega-3 fatty acids, which are important for brain and heart health. A 1-ounce serving of the sweet nut meets 5 percent of the DV for omega-3s. Not a significant source, but it can certainly help you get a little closer to your daily needs. With so many calories and so much fat in a little serving, you may think there's no positive connection between pistachios and weight loss. But researchers are finding that pistachio nuts make a healthy addition to any weight-loss plan, especially when you eat them in the shell. 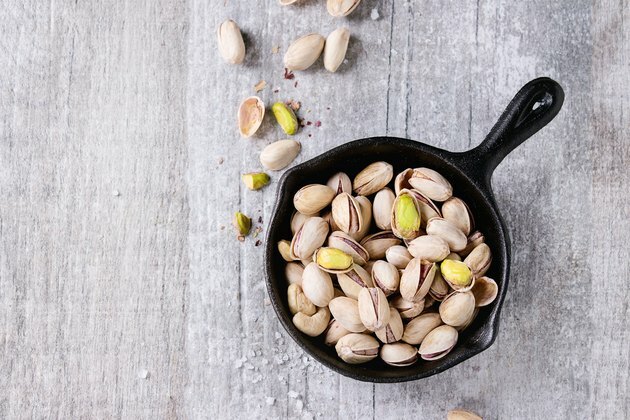 A 12-week study published in 2010 in the Journal of the American College of Nutrition found that, in a group of participants following a reduced-calorie weight-loss diet, snacking on a 220-calorie serving of pistachios helped lower body mass index better than snacking on a 240-calorie serving of pretzels. The pistachio-eating group also experienced a significant improvement in blood triglyceride levels. Snacking on pistachios in the shell may also make you more mindful of what you're eating so you eat less. A 2011 study published in Appetite found that participants ate fewer overall calories — almost 50 fewer calories — when eating pistachios in the shell versus shelled pistachios, but still reported that they felt satisfied on the amount consumed. Pistachios are also a good source of protein and fiber, nutrients that help control appetite. So you may feel more satisfied when snacking on a bowl of pistachios than a bowl of pretzels. The fat in pistachios may also support weight loss. Monounsaturated and polyunsaturated fats have a greater thermic effect, which means they burn more calories, than saturated fat. Plus, there's evidence that your body may not absorb all the fat in the nut, so you may actually get fewer calories than you think. The key to managing pistachios and weight loss is to be aware of your overall calorie consumption. In order to lose weight, you must eat fewer calories than your body burns. Pistachios may support weight loss by keeping you full longer and making it easier for you to stick with your reduced-calorie diet, but be careful not to eat too many. Due to the fat content, pistachios are considered an energy-dense food. Consuming more calories than your body needs, no matter where they come from, leads to weight gain. Read more: What is the Correct Serving Size for Nuts? Whether you eat pistachios or other types of nuts, you really can't go wrong if your goal is to improve your health. A 2013 study published in the New England Journal of Medicine found that people who consumed more nuts were at a lower risk of death from all causes. The U.S. Department of Agriculture's ChooseMyPlate recommends that you make nuts a regular part of your healthy diet and use them in place of other sources of protein, such as chicken or beef. But ChooseMyPlate also suggests that you limit your serving of nuts to 1 to 1.5 ounces. When it comes to choosing the healthiest nuts, it may come down to your taste buds and preference. You may find that, because of the serving size (49 kernels) and the work required to eat them (shelling), pistachio nuts make the best choice for you, especially if you're trying to find ways to control your weight. For the record, most of the fat in these nuts comes from the heart-healthy monounsaturated and polyunsaturated fats. Walnuts are an especially good source of polyunsaturated fats and omega-3 fats and may be one of the healthiest nuts to include in your diet. Can Eating Too Many Nuts Make You Fat?